Tuesday April 27th 1909 I did the ironing and churned again today. I worked out of doors most of the afternoon fixing nests to set hens. I now have ten set. It was not a very pleasant day. Wednesday April 28th 1909 I left things so Will could get his own dinner. I went down at 9.12. I did some errands and went over the river I was up home a few moments. Gertrude Newcomb that was come for a days visit with her baby. I went back to Fannies and got some dinner for the boys and prepared things for supper and come home at 4.30 to do evening work. I did not feel very well so went to bed early. a drizzling day. [the following is written vertically in the right margin of the above entry] Lady had a little work last night. 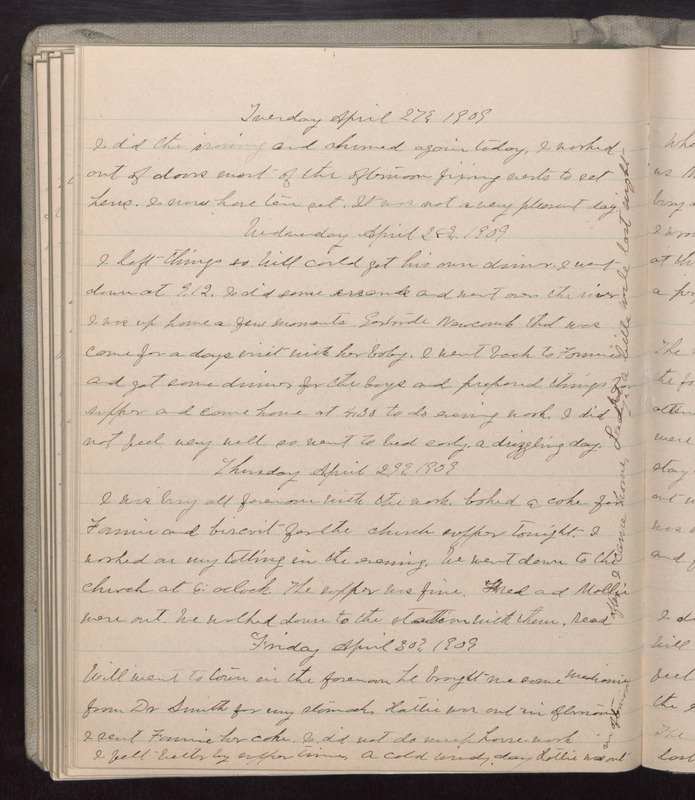 Thursday April 29th 1909 I was busy all forenoon with the work. baked a cake for Fannie and biscuit for the church after supper tonight. I worked on my tatting in the evening. We went down to the church at 6: oclock. The supper was fine . Fred and Mollie were out. We walked down to the station with them. Read after I came home. Friday April 30th 1909 Will went to town in the forenoon. he brought me some medicine from Dr Smith for my stomach. Hattie was out in afternoon and sent Fannie her cake. I did not do much house-work I felt better by supper time. A cold windy day. Lottie was out in afternoon.